Also, he faces his worst plight when Sita Mata is abducted by Ravana (the ego). The Ego (Ravana) is supported by various warriors who are extremely powerful. One among them is Ravana's son...Meg-nad (literally means, The Sound of Clouds). It's not difficult to understand that our ever agitating Mind is clouded with the commotion of "Thoughts"...which never ever allows us to seek rest into the deeper solitude of our Inner Self. Meg-nad (The Sound of Clouds/Thoughts) who is the son of Ravana (the Ego) is too powerful to overcome. BUT !!! THE HANUMAN (who is Son of The Wind God)...it's through the Wind that Life Force (Pran Shakti) flows within Us. The whole Monkey Army is nothing but, forces of the Life Force transmitting Air (Pran Vayu). Thus, with the help from HANUMAN (Pran Shakti) and LAKSHMAN (Concentrated Mind), RAM (Atma) defeats RAVAN (Ego) in order to come in union with SITA (Kundalini Shakti)......What a Beautiful Story!!! Isn't Ramayana after all, "JOURNEY OF THE SOUL"??? Who is KUMBHAKARNA? Let us understand. Kumbhakarna sleeps for 6 months and is awake for 6 months. 50% Ignorant + 50% Wise. It is the "I" of a commoner, like you & me. Wise enough to advise Ravana to withdraw from fighting with Lord Rama, yet ignorant enough to join the fight, lacking Vibhishan's wisdom of Surrendering (समर्पण) at Lord's feet 'at any cost'. SUGRIVA = Su means Good + Griva means Throat = A Throat that is energized/cleansed thru Yoga/Pranayam. 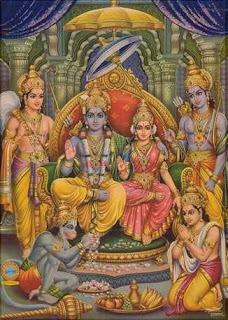 Needless to say, SUGRIVA being the King of Vanaras supplies Hanuman (Pran) as well as the whole Vanar Sena (Pran Vayu) to assist RAM (The Atma) is his endeavours to free SITA (The Kundalini Shakti) from RAVAN (The Ego). A sincere practitioner of Pranayam and Meditation can experience and comprehend this phenomenon in a relatively short span of time. So next time we feel scratchy while Meditating or Japa, lets not take the Surpanakha (Nails) to get married to Lakshman :-) ....Control...Observe...Get Over...lets slay her nose and drive her out !!! !